Am reposting this as we are just past the 45th anniversary pf Corky’s capture. She was captured on 11th December 1969. Can you imagine that? Humans are held in captivity because they have committed crimes against society or in hostage situations. In the latter scenarios, people and governments negotiate for their release. In the interim, the captive humans can retain some hope of release because they know that fellow members of their species are working on their behalf behind the scenes. This is not so for poor whales like Corky. Her family cannot negotiate, cannot campaign to beings who can help. 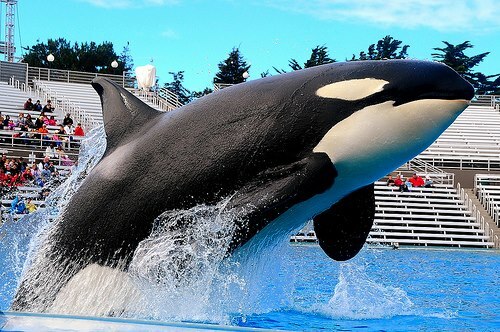 This is the true story of Corky, a female killer whale better known as Shamu. In 1988 Corky and her cousin, Orky were purchased from Marineland for 23.4 million dollars. In 1989, Orky died at the age of 30. Corky now swims at Seaworld, San Diego. Between 1978 and 1986, Corky had given birth a total of seven times. The longest surviving baby lived 46 days. These animals are dying to amaze us. Start with the capture itself. Start with the terror that must have been in the ocean that night. A violent storm raged in Pender Harbour. There were a group of fishermen waiting there who were geared up and ready to go because they had captured and sold whales the year before. The A-5 pod – Corky’s family – came into the narrow entrance of Pender Harbour during the howling wind and dense rainstorm. Who knows why? Maybe they were looking for family members that were lost. The fishermen who had been waiting jumped into their boats and quickly surrounded the whales with nets. They worked all night and in the morning they had about half of the whales behind nets and about half of them remaining outside. This illustrates something about the closeness of the membership of this Orca family. Because some of them were behind nets, the rest of them stayed; and because the rest of them stayed they were easily rounded up too. As we know, one of the escapees was Corky’s mother. safety and well-being, to be able to rejoin her Mum and siblings who are known to researchers and swim free in the waters of British Columbia, Canada. its owner Anheuser Busch know that people around the world are aware of Corky! Remember to ADD your NAME, ADDRESS & DATE! This entry was posted in Animal Work, whales and tagged Corky the Orca, Mother Nature, Seaworld, whales. Bookmark the permalink. I know Paul Spong’s work and devotion to Corky! I wonder if they will ever release her. It would be wonderful if they would. They know her pod and they would love her back. Can you imagine Corky’s elation at being re-united. Oh, humans where are you?? ?